POSITIVE POWER FOCUS - THE WAR FOR A POSITIVE MIND IS FOUGHT ON THE BATTLEFIELD OF FOCUS - POSITIVE THINKING DOCTOR - DAVID J. ABBOTT M.D. 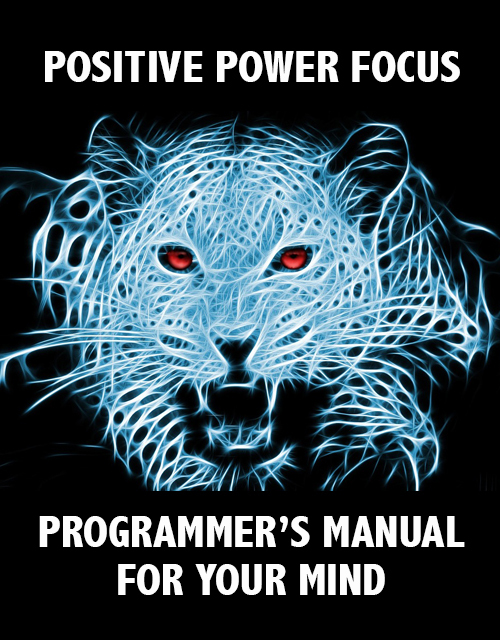 The Programmer's Manual for Your Mind teaches you how to use the power of positive focus to reprogram your mind. The battle for a positive mind is fought on the battlefield of focus. Until you learn to control your mental focus, you will never win the battle for a positive mind. Positive Power Focus is excerpted from the Programmer's Manual for Your Mind written by the Positive Thinking Doctor, David J. Abbott M.D. Once you master the Four Laws of Focus, you can download Programmer's Manual for Your Mind in eBook format and start reprogramming your mind with a positive operating system. You are engaged in mortal mental combat, and your mind is ground zero. It's high time you learned how to control your mental focus. Focus is your most important tool for reprogramming your mind. You will use it more often and in more ways than any other programming tool. You will also use it in combination with the other tools found in Programmer’s Manual for Your Mind. A smart woodsman sharpens his axe before he starts chopping. A blunt axe wastes time and energy. When the axe is dull, he chops ten times as hard to have the same effect. A smart programmer sharpens the axe of focus before starting to work in the jungle of personal transformation. The axe of focus penetrates and clears the underbrush of negativity and limitation better than any other tool. When the thorns of negativity and limitation block your progress, the axe of focus clears the way to start running positive programs in your mind. Four powerful laws of focus give you the mental leverage you need to run and reprogram your mind. First Law of Focus: What you think about expands. Second Law of Focus: Your mind can only think one thought at a time. When you focus on a thought, it forces your mind to look in the direction of that thought. Third Law of Focus: Focus is a switch that turns on images in your mind. Fourth Law of Focus: Focus selects the software that runs in your mind. These four laws give you the power to take charge of your mind. The only way dreams ever come true is for them to expand from your thoughts. Dreams start as a seed planted in your mind. That seed grows and expands into a dominant thought. Finally, you take action, and the thought expands into your life. The first law of focus works for all types of thoughts. It does not matter if they are positive or negative. Focus works for you or against you, helps you or harms you. When your mental focus is positive, it has an enormously beneficial effect. When the focus is negative, it only brings misery. Learn to select your thoughts carefully because you want only good things to expand into your life. This law of focus is inescapable. Your brain provides its own focus if you do not select one. If you do not provide your own focus, you end up at a destination selected by other people. The first law of focus is for everyone, even people who feel down and out. No matter how far you are down, you are never out, if you take advantage of this law. If you maintain a positive focus, it is inevitable that you will become a more positive person. There are no exceptions to this law. When you struggle with negative and limiting thoughts, you need to know that this law never fails. When you adopt a positive focus, it is only a matter of time before you become a more positive person. No matter how discouraged you may be, this law always delivers what it promises. Positive focus is guaranteed to transform your mind and move your life in a positive direction. There is no reason to surrender to despair. SECOND LAW OF FOCUS: YOUR MIND CAN ONLY THINK ONE THOUGHT AT A TIME. WHEN YOU FOCUS ON A THOUGHT, YOU FORCE YOUR MIND TO LOOK IN THE DIRECTION OF THAT THOUGHT. You can force your mind to look in any direction using the power of focus. The second law of focus gives you the high ground in the battle for a positive mind. The high ground is your stream of consciousness. Whoever controls your stream of consciousness controls your mind and your life. Old programming has direct and immediate access to your mind. This gives old programming a distinct advantage in controlling your thoughts. The instant you put positive things into your mind, your stream of consciousness becomes a battlefield. Most of the time the old programming holds sway. The high ground of the mind changes hands at the speed of light. Regaining the high ground is difficult, but not impossible. When you attempt to modify your stream of consciousness, a barrage of old thoughts tries to beat you into submission. Prior programming attempts to control the focus and direction of battle. The only way to win the battle is to change your mental focus. The instant you adopt a positive mental focus, your thoughts move in a positive direction, and the high ground immediately goes to you. It stays with you as long as you control the focus of your mind. At first, your positive thoughts dominate your consciousness for only milliseconds before being tossed off the battlefield by negativity and limitation. Nevertheless, the law of focus prevails. If you keep positive thoughts in ascendancy, you eventually win the battle. The high ground of the mind is in your hands and under your control. After you control the high ground, what you focus upon expands into your life. Once you control the high ground, your stream of consciousness becomes a major ally supporting you with a stream of positive thoughts. This battle is not a spectator sport in which you sit in the bleachers of life and nod with approval at the wonderful thoughts passing through your mind. Maintaining a positive focus requires unremitting action. When you relinquish control in the battle of focus, your mind switches back to the default programming inherited from your parents and culture. The mind restarts the old programs of misery and dysfunction that have controlled you for so many years. Maintaining the high ground is mandatory. All reprogramming techniques aim for control of this high ground. When your stream of consciousness works for you rather than against you, the high ground is in your control. Listen to your stream of consciousness, and you instantly know how you are faring in the battle for the high ground of your mind. When you say the word elephant, a picture of an elephant pops into your mind. When you say the word goldfish, a picture of a goldfish pops into your mind. Neither word causes you to see the letters E-L-E-P-H-A-N-T or G-O-L-D-F-I-S-H in your consciousness. The word elephant is a switch that turns on a picture in your mind. That simple word may even turn on a picture of a specific elephant at a specific location and time. This peculiarity of the way the mind works gives focus a point of leverage for controlling your thoughts. Because of this phenomenon, words are like switches or buttons that you push to create positive pictures in your mind. The world pushes your focus buttons all the time. Advertisers know which buttons to push to make you purchase goods and services. A word or phrase flips a switch in your mind and changes the course of your life. The word “fire” creates fearful images in the minds of everyone within earshot. Nike has taken the words “just do it”, and linked them with visions of athletic excellence and an aggressive approach to life. You can use the same technique to control your mental focus. Choose a word and link it with a picture that takes you in the direction of your dreams. My sailboat is called a Privilege 39. When I hear the word “privilege”, a picture of my yacht pops into my mind. I visualize my sailboat cruising the Great Barrier Reef of Australia or anchored in the atolls of the South Pacific. Knowing how to use a word to turn on pictures in your mind is extremely useful. You can instantly create a positive focus by saying a single word. You also become aware of a dark side to this phenomenon. Single words or phrases can create images that make you feel negative, disempower you, and steal your dreams. When I was in college, the words “organic chemistry” instantly put a feeling of dread in the pit of my stomach. In my mind, I could see the dreaded chemistry laboratory with all the experiments that never seemed to come out exactly right. This course decided whether I would go to medical school and become a doctor. Words are extremely powerful because they turn on visualizations that take you to your dreams or nightmares. When you use positive and empowering words, you create positive and empowering images in your mind. When your words are negative, then pictures of negativity and limitation pop into your mind. The visual focus created by saying a word has another downside that you must avoid. When I tell you to not think of the word “hippopotamus”, you immediately think of and visualize a hippopotamus. Trying not to think of hippopotamus guarantees that you will think it and see it in your mind. There is only one way to not think about hippopotamuses. You must think about platypuses instead. When you start thinking about platypuses, the hippos magically disappear. Everyone has too many hippos in their mind. They become discouraged when they try to get rid of the hippos by trying not to think about them. The power of focus guarantees that you can never directly get rid of a negative undesirable focus. The only way to escape is to start thinking about platypuses and continue thinking about platypuses until the hippos disappear. You will never get negativity and limitation out of your life by trying to make them go away. However, if you focus on positive things, then negativity and limitation magically disappear. Focus is the way you tell your mind what it should be doing. After you have positive and empowering programs installed in your mind, the magic of focus selects those programs and starts them running. When you focus on a particular thought, you select a program that the mind runs for the next few seconds. The mind can only run one program at a time. If you select that program using the power of focus, then you are running your mind rather than it running you. You can force your mind to run positive and empowering programs for long periods if you maintain your positive focus for long periods. Reading books on motivation and positive thinking keeps positive programs running for the duration of the reading session. Listening to motivational recordings keeps positive programs running for hours at a time. If you want to force your mind to run positive programs for days and weeks at a time, then write your own book on positive thinking. It is not necessary to say anything new or original in your book. The process of writing positive thoughts for hundreds of hours focuses your mind on hundreds of new resourceful ideas. Your mind will run positive programs day after day. The process of writing on positive subjects subdues your stream of consciousness and brings it into alignment with your positive purpose. Your stream of consciousness is center stage fully committed to running positive programs for as long as you continue to write. The war for a positive mind is fought on the battlefield of focus, and the Programmer's Manual for Your Mind has the tools you need to win the battle. You are engaged in mental mortal combat, and its time for you to learn how to control your mental focus.